Since 2011, Baywater Farms has been adapting to new challenges, and we’ve been using adversity as a source of inspiration for change. Being challenged in life, no matter what that challenge is, will lead to growth. Challenges build character. Since 2011, Baywater Farms has been adapting to new challenges, and we’ve been using adversity as a source of inspiration for change. Turf grass used to be the Holloway family’s cash crop, but the power of hydroponics can’t be denied. Read on to learn more about why the economic necessity of hydroponics and hydroponic growing changed the fortunes of our humble family farm. The Great Recession seems like a distant memory now. But it can be easy to forget that it was only about a decade ago, during the mid-2000s. Back then, the Holloways only focused on growing turf grass on their land in Wicomico County. But this narrow focus meant that a new way forward had to be found, and the solution was in the secret of hydroponics. There’s little dispute that our farm switching from turf grass to hydroponically-grown produce was wildly successful. 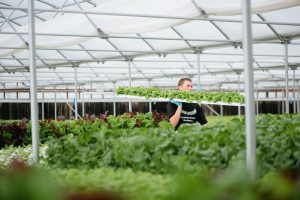 A single greenhouse with only one load of lettuce expanded – quickly. The first full yield produced 15,000 heads of our delicious Bibb lettuce. But the venture into hydroponic growing wouldn’t have paid off without clients having a taste, which is why once the first harvest came in, we began to transport samples, which in turn led to invaluable contracts. Our property now includes a single half-acre of greenhouses, but that small plot has equaled roughly 24 acres worth of lettuce and various other herbs and crops. Quantico Creek is Baywater Farms’ sister farm. Quantico Creek has taken over the business of grass production, over 2,000 acres worth of it, in fact. Big box home improvement stores have become major clients, along with professional home builders. But the grass, also known as sod, needs to have rejuvenated fields before the next harvest can be successful. That’s part of the reason our field crops have become such an integral part of our production cycle. WANT THE FRESHEST, HYDROPONICALLY GROWN PRODUCE? CONTACT US TODAY! This entry was posted on Friday, December 8th, 2017 at 11:08 am. Both comments and pings are currently closed.